Increase the visibility of your business: Your project will find a reference in our marketing campaigns including mailings, reports, evaluations and press releases and will, therefore, spread the word about your outstanding performance internationally. Help a good cause: we.CONECT will select a charity on behalf of the winners and exclusively donate $ 1,000 to support their individual projects. Have you recently worked on a project related to car HMI and User Experience? Did your project accomplish outstanding results or promises to achieve great outcomes? Then join us for the launch of our Car HMI Award ceremony 2019 in Detroit and share your success. We are inviting all global industry leaders and pioneers to apply with their UX and HMI projects and showcase their outstanding achievements. Based on all entries, the jury will nominate 3 projects in each category, which will get the unique chance to be presented during the official Award Ceremony & Networking Dinner on April 29, 2019, in Detroit. All winners will not only receive a certificate and an exclusive trophy but we.CONECT will also donate $ 1,000 to a charity of our choice. Apply now for the Car HMI USA Award and get recognized for your achievements. Please also see our terms and conditions for further details. • Shine and increase the visibility of your project and business. • Boost your project and foster enthusiasm of your efforts among your colleagues, employees, management and team members. • Help a good cause as we will select a charity on behalf of the winners and exclusively donate $ 1,000 to support their individual projects. • Celebrate your achievements and the hard work you have put in. • Share your success with the entire Car HMI community. The submitted application should be related to an HMI project at your company. The implementation of the project must not date back longer than 2 years. A company may nominate more than one project for the award. All nominees will be asked to prepare a 2 minute-long video showcasing their project. Style, format, and content can be based on individual/corporate design. The video will be shown live on stage at the award ceremony on April 29, 2019. 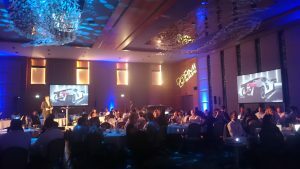 Failure to submit an award video (or further project documentation that is required at the event) within the given time frame, may, unfortunately, result in disqualification. 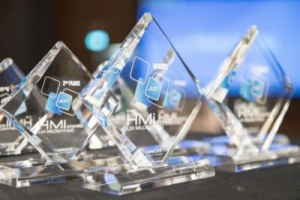 No applications for the Car HMI Awards 2019 will be considered after the deadline March 01, 2019. The German children’s cancer charity supports and finances patient-oriented research projects in order to increase the young patients’ chances of a full recovery, ensure safe treatments and find new therapies so that long term implications can be reduced to a minimum or completely eliminated. The winner of the Car HMI Europe Award 2018 in the category ‘Most Innovative Development process’ was Eindhoven University of Technology with their project ‘Scribble.’ – a haptic interface that lets you draw your way through traffic. The 2nd place went to Rightware with their project ‘Kanzi Maps’ and the 3rd place went to Arbe Robotics with their project ‘Ultra High Resolution Radar’. Luxofts ‘LUCEE – Luxoft User Centered EV-Infotainment’, which seamlessly transfers the smartphone world into the car environment, won in the ‘Most User-Friendly HMI Feature’. Analog Devices and their ‘Advanced HMI and In-Cabin Sensing’ project came in 2nd. The 3rd place was awarded to Monotype and their project ‘M-Kit’. Winner of the Special Jury Award was Mercedes Benz and their project ‘Mercedes-Benz User eXperience’ – a new car infotainment system, which puts the user experience as first priority and therefore has the ability to learn thanks to AI. It can be adapted to suit the user’s needs and creates an emotional connection between vehicle and driver. The Community Choice Award went to Rightware with their project ‘Kanzi maps’, which brings mapping into a single, designer-led UI development workflow, enabling rich visualization for ADAS and all stages of autonomous driving.